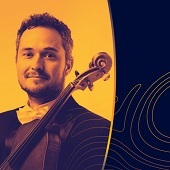 Auckland Philharmonia Orchestra | APO GO: Free Spirit - Thursday, 1 November, 2018 8:00p.m. Web bookings are now closed for this performance. Call APO Ticketing on 623 1052 for more info. Thursday, 1 November, 2018 8:00p.m. APO GO tickets will be held at the APO Box Office for collection on the evening of the performance. Please have your membership card with you as you will be asked to present this at the time of collection. Seating is best available and at the discretion of APO Ticketing. For more information please see our Terms & Conditions.